Since taking over Canada’s women’s national team in late 2011, John Herdman has lived the “leave no stone unturned” mentality, having meticulously planned out every small detail in Canada’s road to their home World Cup. The final phase of Canada’s World Cup preparation has already taken the team to Los Angeles, where they played a couple of closed-door scrimmages. 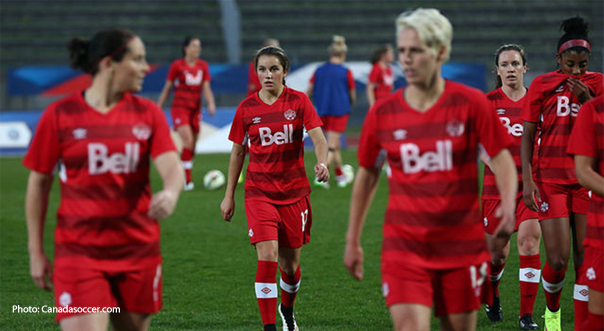 Canada tied the US Women’s National team 1-1 on May 13th and beat Mexico 1-0 the following day. The team then trained in Mexico for a week, and returned to Canada last night to continue their final World Cup preparations and train for their friendly on May 29th against England. In the conventional sense, heat acclimation refers to increased tolerance to the heat that comes with spending time in high temperatures, but there is a wealth of scientific literature emerging that shows training in the heat can actually produce secondary physiological changes that can translate to statistically significant performance gains. A thorough trial published in the European Journal of Applied Physics in 2012 had eight highly trained male rowers in New Zealand train in 39.5°C heat in 90 minute sessions for five consecutive days. The results? The rowers had a 4.5% increase in plasma volume, which is quite significant, decreased perceived body temperature at rest (indicating increased heat tolerance), and increased “endurance exercise capacity,” as their performance on a 2000m rowing time trial improved by 1.5%. The most significant of these results, and the one that Herdman was likely referring to when he mentioned “producing more oxygen in the body” is the increase in plasma volume. In the above study, heat stress stimulated the rowers’ bodies to produce more blood plasma, which can result in an increased cardiac output, the volume of blood pumped by the heart per minute. An increased cardiac output results in a higher volume of oxygen (VO2) being pumped to the body’s muscles, which improves aerobic fitness and endurance. Furthermore, the 4.5% expansion in plasma volume is even more impressive when you consider that the rowers that underwent the heat treatment were already highly trained, with a high plasma volume to begin with. It is much more difficult to increase fitness levels of athletes that are already in peak physical condition, compared to moderately active or inactive people, so the fact that plasma volume increased significantly bodes well for other highly trained athletes interested in this technique. So, how could this change in plasma volume translate to performance benefits on the soccer field for the Canadian national team? Award-winning sports science journalist Alex Hutchinson, himself a former Canadian national team track and field and cross country runner, has visited this topic extensively for Runner's World, and he thinks these changes in plasma volume could translate to endurance benefits on the soccer field. A study published in the Scandanavian Journal of Medicine and Science in Sports in 2011 tested well trained soccer players after heat acclimation training using intermittent sprint tests, mimicking the demands of a soccer game. After a 7-day acclimation program in 35°C heat, performance on a yo-yo intermittent sprint test (20 meter shuttle runs at increasing speeds) increased by 7-9% compared to players’ performance on the test before the heat training. There were also significant increases in plasma volume and decreases in submaximal exercising heart rate. Hutchinson says it takes ten to fourteen days to fully acclimate, though many studies, including the two previously mentioned, have shown performance benefits after just five to seven days. A review published in Sports Medicine in 2014 concluded that acclimation programs of seven days or less can provide modest performance benefits and “thermoregulatory adaptations,” but that current evidence shows eight to fourteen days of acclimation can return even greater performance benefits. Specific details on the heat training Canada underwent in Mexico are unclear, which includes various factors that can contribute the effectiveness of the technique, including quantity and duration of the sessions. What is known is that the team was in Mexico for a week, a “short-term” acclimation period. Additionally, the scientific literature shows the ergogenic benefits from this technique can happen in anywhere from 25°C heat and above, easily attainable in Cancun, Mexico where Canada stayed for the past week. The physiological benefits picked up in mid to late May wouldn’t last all the way until the end of June or early July, but it certainly isn’t an all or nothing approach. The team wouldn’t still have fully elevated blood plasma by late June if they are in the knockout round, but, compared to doing no heat acclimation, they would have an advantage at some point in the tournament. Heat acclimation is certainly an interesting and emerging ergogenic technique. If John Herdman wants to propel his team to the final of the World Cup on their home turf, which he has repeatedly mentioned, he can use all the help he can get. Thanks to Alex Hutchinson for his input on this training technique. Hutchinson is an award winning author and journalist whose work appears in Runner's World, the Globe and Mail, Popular Mechanics, the New York Times, The Walrus and other publications. Hutchinson has a Ph.D. in physics from the University of Cambridge and is a former physicist. Thanks to Gerry Moddejonge from the Edmonton Sun for the audio from John Herdman’s media availability at the Edmonton Chamber of Commerce on April 20th.